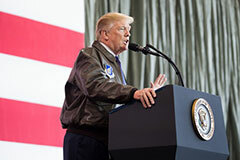 Word-for-Word Remarks by President Trump to Troops in Iraq: "We Will Never Let You Down, Remember That"
(Iraq) — [Whitehouse.gov] THE PRESIDENT: Well, first of all, at ease. At ease. Let's have a good time. Let's have a good time. And we had an incredible meeting that lasted for about an hour, and you have no idea what we've come up with. You're going to be so happy. You're going to be so happy. THE PRESIDENT: (Laughs.) Let's let her make this speech, right? She's great. A very popular First Lady and a great person. I want to thank everyone at Al Asad Air Base. Special people. We came in, we were — we felt very safe coming in. It was a pretty difficult journey in certain ways, but we felt very, very good; very safe. And also, we knew exactly where we were going, and we're going to say hello to you and wish you all a Merry Christmas and a happy New Year. Very important. Thank you very much. Great job. 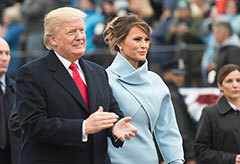 So, Melania and I are thrilled to be here with the extraordinary men and women of the American Armed Forces — the greatest military, and — especially as we get all of these billions and billions of dollars of new equipment that I approved over the last two years. You're getting such new equipment, your eyes are popping, right? (Applause.) Your eyes are popping. You're getting the best equipment in the world. As you know, it was being very rapidly depleted, and it wasn't good. And we weren't going to let that happen to you or to our country. And I just want you to relax. Let's have a good time for a few minutes, and then I'll be heading to another location, and then I'll be heading back. But I have you totally in mind — totally in mind. We came to Al Asad to share our eternal gratitude for everything you do to keep America safe, strong, and free. Though you are thousands of miles away from your home and your loved ones, I hope you all had a Merry Christmas. I also know that, speaking for your families, they are missing you and they love you. And you know they're every bit a part of your success; they make it possible. So, they're very special to us, all of the families. It's because of your sacrifice that America's families can celebrate in safety and in peace. And we're doing great back at home. There are many incredible patriots to recognize here, right now. And I'd like to start by saying a few words for Colonel Michael Maddox. Colonel, thank you very much. (Applause.) Thank you, Colonel. Great job.